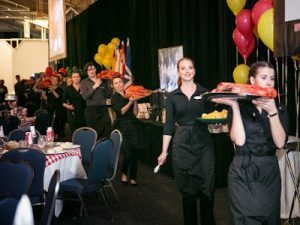 A daunting affair for organisers and staff at the Atlantic Canada sponsored dinner at the massive Cunard Centre in Halifax for the final get together for travel trade show Rendez-vous Canada. A massive 1.5 tonnes of fresh hard shell lobsters were served by 130 waiters and waitresses. 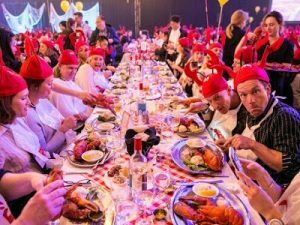 1875 delegates, buyers, sellers and media were registered for RVC Canada 2018 and they all turned up for the final lobster dinner which went like clockwork. 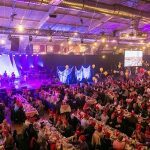 The evening was a collaborative effort by Tourism Nova Scotia, Tourism New Brunswick, Tourism Prince Edward Island and Newfoundland and Labrador Tourism, featuring a parade of lobster, Kilted Chef, Alain Bosse and an epic night of entertainment food and fun. The venue was the Cunard Centre – once a vast cargo shed on Halifax’s bustling waterfront, today the Cunard Centre hosts premier events on an international scale. At over 45,000 square feet of uninterrupted floor space, it’s one of the largest venues in the city. Innovative and multifunctional, natural light shines through floor-to-ceiling retractable windows that bring in fresh salt air, and the sights and sounds of the Sea Port. Guests can get outside to “the Brow” to marvel as ships and cruise liners manoeuvre around the port. Highlights of the evening included pipers, dancers and musical renditions and presentations by Booty Boppin’ Brass Band, Jimmy Rankin, Gordon MacKeeman, Rum Ragged as well as Mik’maw and Celtic drummers. Australia was represented by 15 buyers all taking in the opportunity to promote some of the fantastic new products that the sellers had on offer. Last year, Tourism Minister Chagger launched Canada’s Tourism Vision a five-year, whole-of-government approach to increasing the number of international tourists who come to Canada by seizing the global opportunity that tourism offers. Last year, Canada had its best year ever for international visitors and the projection for 2018 and beyond is even better.